Chikungunya & Dengue infections … and now Zika infections … represent some of the world’s greatest health threats, increasing 30-fold in the last 50 years, expanding to new countries ~ annually threatening at least 2.5 billion people around the globe. Dengue infections have been constantly circulating in Yucatan since the 1980’s. Next: Chikungunya virus infections popped up in large numbers in the summer & fall of 2015. Even more recently: It now is fairly clear to some Yucatecan physicians that we also have had low levels of Zika virus circulating in Yucatan since last September. ~ Retro-orbital pain (pain behind the eyes) is characteristic of Dengue. ~ Eye irritation w/eye lesions and short duration (3-4 days) of symptoms are characteristic of Zika. ~ Bilateral pain in hands and feet, and long durations (10 – 21 days) of symptoms, sometimes with months of lingering major joint pain … are characteristic of Chikungunya. In addition to Dengue’s well know health consequences, Zika virus infections in pregnant moms appears to cause unusually high numbers of distinctive microcephaly (tiny heads) for new-born babies who were infected in utero. 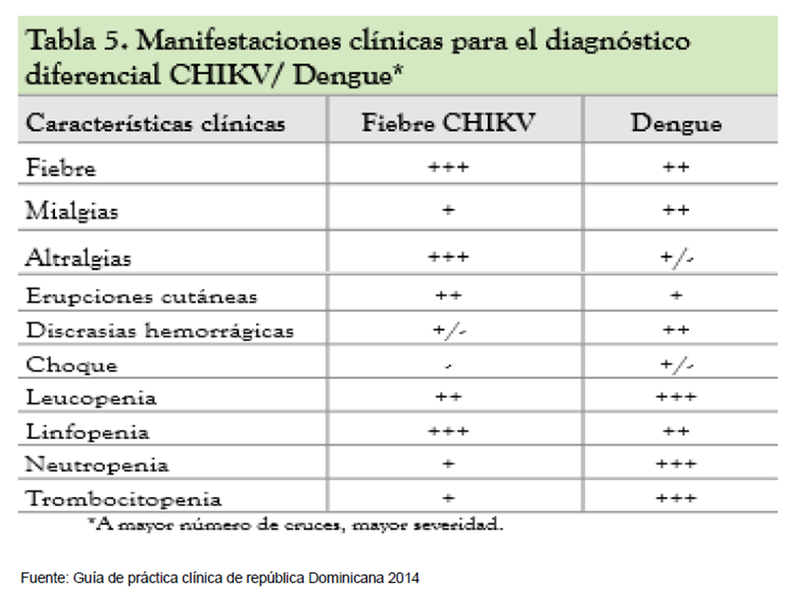 Chikungunya presents difficult health challenges in the forms of spiking bi-modal (or multi-modal) fevers, horrible joint pain, and joint pain and fatigue that lingers for months for some CHIKV patients. In addition to those problems: Yucatan health officials have just announced 197 cases of fatal liver cirrhosis in Merida for 2015 ~ spiked up over 3X higher ~ vs just 56 cases in 2014. Health officials understand that this big 250% increase in fatal liver cirrhosis cases is due to people with Chikungunya + liver damage who continue to drink alcohol. Chikungunya infections temporarily damage the liver, raising liver enzymes (enzimas hepaticas) by 3X due to liver inflammation. Drinking alcohol while having an inflamed liver can cause SERIOUS permanent-damage to the liver. All lab tests (NS1, PRNT, & IgM ELISA) that are done AFTER the patient is over with their fever, simply do not reliably distinguish between the different flaviviruses, because Dengue, Chikungunya, St. Louis Encephalitis, and Zika antibodies all have too much cross-reactivity with the test reagents. 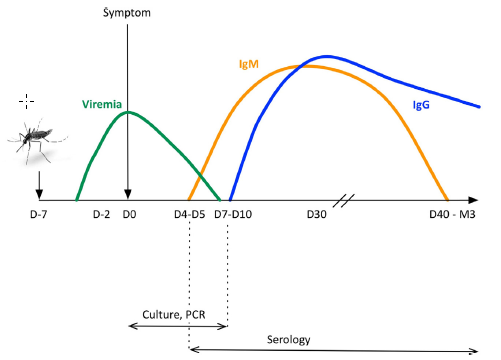 While Clinical symptoms are more reliable indicators** than the serological tests (NS1, PRNT, & IgM ELISA), instead the gold-standard for differentiating between Dengue, Chikungunya, St. Louis Encephalitis and Zika is still RT-PCR testing (gene sequencing of isolates) performed around Days 4 – 7 while still having a fever. In the absence of RT-PCR results from while the patient has a fever, clinical symptoms are the next best thing. Chikungunya (CHIKV) & Dengue (DENV) viruses are now permanently found across the Yucatan & Mexico, extending up into the USA. Both viruses are carried by the same mosquito: Aedes aegypti. Dengue , Zika and Chikungunya viral infections are transmitted only by infected Aedes aegypti mosquito bites. … Protecting ourselves from mosquito bites is paramount to our health. Eliminating mosquito bites & breeding sites from our homes & communities are essential to stopping Dengue, Zika and Chikungunya infections & fevers. We ask that everyone reading this article, pause and thank Dr. Maria Alba Loroño Pino and Dr. José Arturo Farfan Ale for their 30 years of fine service to Merida and Yucatan in their ongoing research & education efforts for both Dengue and Chikungunya viruses. We also thank the WHO, the US NIH, and CDC for their publications used for background information presented below. Note that all of the FINE plots, tables and diagram materials presented below are due to Dr. Loroño’s and Dr. Farfan’s fine on-going work – and DILIGENT searching … and summarizing … of the best Dengue & Chikungunya research from around the world. ~ Please do NOT copy or use the images or tables or diagrams etc without giving proper attribution to: * Dra. Maria Alba Loroño Pino and Dr. José Arturo Farfan Ale, UADY Centro de Investigaciónes Regionales * as all of the image, table, and diagram materials are copyright protected, not for general public use. The text in the article is Yucalandia.com’s and is available for copying with proper attribution. Zika virus, like Dengue and Chikungunya viruses, is spread to people through Aedes aegypti mosquito bites. Zika virus disease (Zika) most common symptoms are fever, rash, joint pain, and red eyes – and possibly eye lesions. Symptoms are usually mild, lasting from several days to a week. Severe symptoms requiring hospitalization are uncommon. Most Zika virus infected patients experience almost no symptoms or only very mild symptoms. Still, it is very important to STOP ZIKA now … because it it related (’causes’) microcephaly (tiny heads) for Zika-infected babies in the womb ~ a lifelong affliction for these infants. Think: Spiking fever, biphasic fever*, joint / muscle / tendon pain, rash, pain in the hands & feet, plus … liver inflammation**, … and serious blood complications: Watch for low platelet count symptoms***. … Plus one more nasty effect: 5% to 50% of CHIKV patients suffer from severe joint pain for years. *-*Be sure to talk with your physician before stopping taking blood thinners, but note that continuing blood thinners may trigger fatal bleeding in both DENV & CHIKV infections, if your Blood Platelet Counts drop***. ~ When your CHIKV or DENV fever (elevated temperature) ends, (typically after 8 – 10 days of fever), the WHO says you can resume taking NSAIDs or blood thinners. Don’t Drink … if you have any Chikungunya symptoms (fever, rash, etc). There were 197 cases of fatal liver cirrhosis in Merida 2015 ~ spiking up over 3X higher ~ versus just 56 cases in 2014. Health officials understand that this big 250% increase in fatal liver cirrhosis cases is due to people with Chikungunya + liver damage … who continue to drink alcohol … during or after the fever. 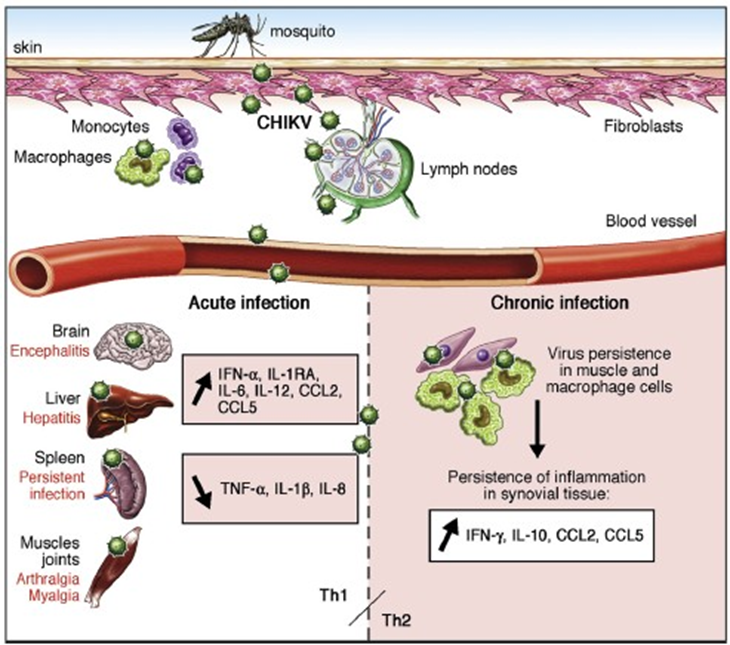 Chikungunya infections damage the liver, raising liver enzymes (enzimas hepáticas) by 3X, due to liver inflammation. … Drinking alcohol while having an inflamed liver can cause SERIOUS permanent-damage to the liver. No drinking for months … until your liver enzymes heal back to normal levels. Note that the liver enzyme (enzimas hepáticas) test is easily done by most local clinical laboratories… Just walk-in, have them take a blood sample, and get your test results in a few days. *Biphasic fevers last for several days, then the patient feels relief (no fever), and then the fever returns again for several days. **Chikungunya often causes temporary liver inflammation and elevated liver enzymes & creatinine serum levels, so, if you suspect you have CHIKV symptoms, then NO Alcohol consumption for 6 months to a year, until your liver enzyme (enzimes hepaticas) levels return to normal. Note that consuming alcohol while having an inflamed liver can lead to near-permanent liver damage (cirrhosis) . bleeding from wounds that lasts a prolonged period of time or doesn’t stop on its own. If you have any of these symptoms, as a part of a suspected Dengue or Chikungunya virus infection, Get To a Hospital or Doctor’s office, ASAP for a potentially much-needed transfusion. Continuing: A single CHIKV infection offers lifetime immunity … while Dengue (DENV) infections only give immunity to one (1) of the four possible DENV strains, offering protection against just that 1 strain for just a few months + Plus there are worse DENV symptoms with every subsequent re-infection (due to subneutralizing antibodies). How many readers noticed the curious unique step of how CHIKV moves out of our blood vessels into various target organs? Specifically, CHIKV viral replication takes place in our fibroblasts, macrophages and endothelial cells. The infection causes a series of strong innate immunilogical responses, producing numerous pro-inflammatory mediator compounds. Note that there are different CHIKV viral proteins that infect our monocytes and macrophages, which then migrate to our synovial (joint) tissues, liver, muscle and brain tissues … causing some patients to become chronically infected. Do some readers still think it’s OK to drink alcohol during or after a CHIKV infection? Fortunately, CHIKV does not present high risks of death, when treated correctly: Fatality rates from India and Reunion Island patients have shown only 1 fatality for every 1,000 patients, with deaths mainly from neurological complications. Note that the CHIKV Asian-line version that hit Reunion Island had over 50% rates of patients with chronic joint pain, and some showing permanent brain damage. “Spiking fever, searing muscle and joint pain, blood seeping through the skin, shock and possibly death—the severest form of dengue fever can inflict unspeakable misery. 1” … Though as many as 70% of DENV infected patients experience only mild symptoms. and sometimes low platelet counts: Possibly requiring a numero de plaquetas test, especially during Days 4-6 of fever. See list the low platelet count symptoms above***. A few (3% – 5%) get the potentially fatal symptoms of “Dengue Hemorrhagic Fever” (DHF) of Dengue Shock Syndrome (DSS), where DHF symptoms include s bleeding from the eyes, gums, nose, under the skin, or into the GI tract, vomiting, and black stools. Infection by 1 of 4 Dengue (DENV1, DENV2, DENV3, & DENV4) strains gives protection against only that strain for 4 months. A single CHIKV infection however gives lifetime immunity. Infection by any the other three DENV strains are possible after having a DENV infection, and re-infection by the first strain is possible after 4 months. There is no such thing as “Dengue H” (even though some physicians mistakenly talk about “Dengue H”). All four Dengue Virus strains (DV-1, … , DV-4) plus CHIKV are circulating-in and endemic-to the Yucatan. 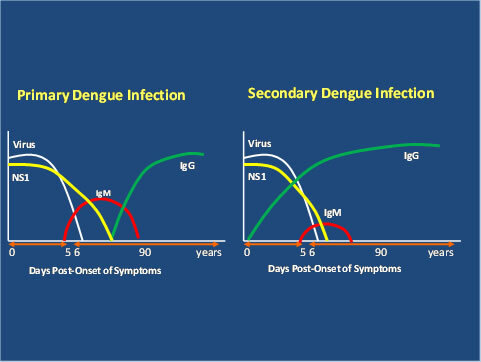 Prior Dengue infections seems to almost universally interfere with your subsequent immune responses to new Dengue infections. Each new infection produces more and more severe symptoms, increasing the likelihood of the possibly fatal Dengue Hemorrhagic Fever (DHF) symptoms & Dengue Shock Syndrome (DSS). There can be a ~ 10 day up to 3 weeks ~ delay between the mosquito bite and onset of Dengue symptoms. … There are anecdotal reports of as little as 4 days between being bitten and the onset of symptoms. 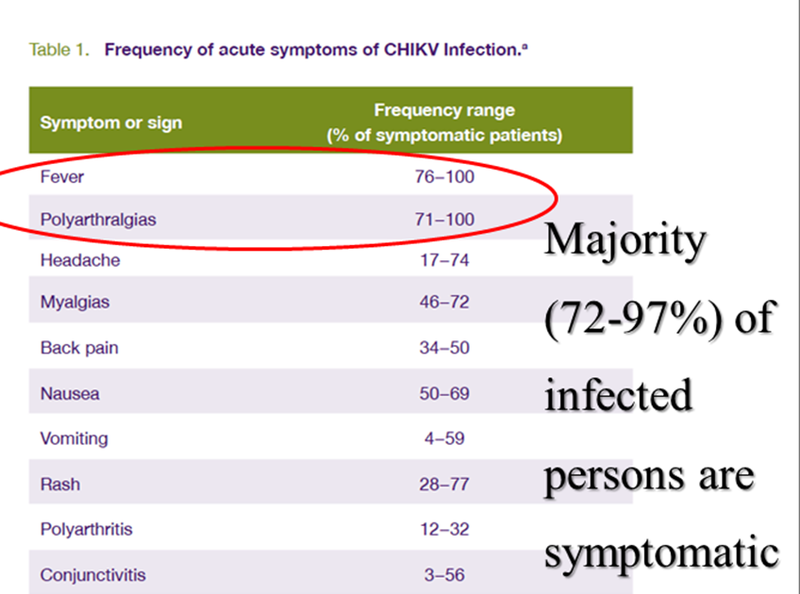 CHIKV symptoms typically appear between 4 – 12 days, but as few as 0 day delays have been reported for CHIKV. Duration: An average Dengue episode represented 14.8 lost days for ambulatory patients and 18.9 days for hospitalized patients. Unfortunately, there are no cures nor anti-viral treatments available for DENV nor CHIKV infections. DENV & CHIKV patients can also get just 1, or 2, … 3, or 4 or more of the symptoms listed above. Oddly, not everyone gets a fever … some people experience just mild flu-like symptoms or almost no symptoms. Studying these plots, we can see that the DENV and CHIKV fevers start about 7 days after we are bitten by an infected Ae. aegypti mosquito. Unfortunately, most lab tests … (“Serology” in the plot – for IgG and IgM antibodies – made by our immune systems) … don’t work until DAY 4 or 5 of the fever. There are a few sophisticated reference/research labs who do RT-PCR testing, but that is uncommon. Still, RT-PCR can find DENV and or CHIKV in the early days of the fever. => Doctors simply have almost no (near-zero) training in laboratory testing, so they often are not aware of the high “False Negative” rates of the tests they order. In addition to the common IgG and IgM serological tests, there are a variety of NS1 antigen test kits. These kits test for a core protein of the virus, which is initially also present only at low levels at first. If your doctor chooses NS1 testing, there are some problems (anomalies) worth considering: Pretty much all the NS1 tests have extremely high False Positive rates ~ postinfection ~ … This means they incorrectly/falsely report ~ post infection – that Dengue virus is present in the patient, when there is no infection remaining. Dengue virus infections are correctly detected by NS1 antigen tests from day 3 to days 8 … and then the NS1 test becomes NOTORIOUS for incorrectly falsely reporting ~ false positives ~ for typically 9 days after our first Dengue infection is OVER. For these combination of common False Negatives & False Positive test results: Know that a patient’s clinical symptoms are often more reliable indicators of CHIKV and DENV infections than the lab test results. … Also know that high IgG levels of antibodies in our blood, show that the person had a PAST DENV or CHIKV infection (as shown in the CDC’s plot here). … to prevent freshly infecting more female Aedes aegypti mosquitoes – because if an uninfected female Aedes aegypti mosquito bites the febrile patient, that mosquito likely becomes a NEW fresh CHIKV or DENV carrier. Killing infected and un-infected Aedes aegypti mosquitoes helps prevent infecting your family, household & neighbors. ~ During the 6 – 10 days of having a fever: NO aspirin, NO Advil, NO Aleve, ~ Motrin, ~ diclofenaco, ~ naproxen sodium, ~ ibuprofen nor other NSAIDs. … IF YOU ARE TAKING BLOOD THINNERS like Warfarin, Coumadin, Xarelto: Contact your physician immediately to consider temporarily suspending their use. … Why? Because they seriously affect our blood-clotting abilities, which can trigger fatal effects if the patient gets the low platelet count symptoms. When your CHIKV or DENV fever (elevated temperatures) ends, after 8 – 10 days, WHO says you can resume our normal NSAIDs or blood thinners usage. ~ Final Note: Watch for low platelet count symptoms, esp. 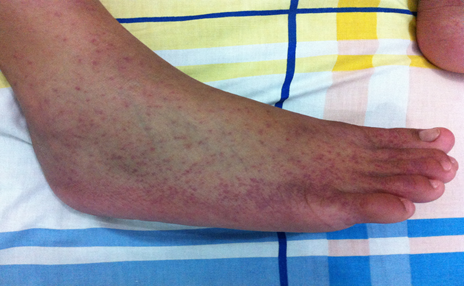 during Days 4 – 6 of fever, for both CHIKV & DENV. If low platelet symptoms are present (see list above***): Take the patient to a hospital for testing and possible transfusions. Modern tropical city life combines large human & mosquito populations with a plethora of cryptic breeding sites … aggravated by increasing resistance to publicly sprayed insecticides. This combination of problems make it very difficult to prevent or control dengue & chikungunya outbreaks using any single approach. Reducing dengue risks in our modern homes requires a multi-pronged approach. Mosquitoes living in our homes are well-shielded from public outdoor insecticide spraying programs, with 60% of Ae. aegypti household females found hiding in our bedrooms, even though Ae. aegypti is a daytime feeder. This proves that effective dengue control in cities requires ~ installing & maintaining good screens ~ to exclude mosquitoes, paired with on-going in-home mosquito control efforts, especially in our bedrooms. 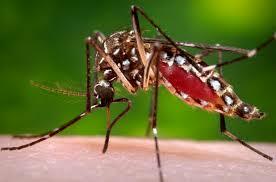 ~ Aedes aegypti mosquitoes prefer to live and feed indoors in our homes, with up to 40 Ae. aegypti females per house, found in 38% of Yucatecan homes that have no window screens. 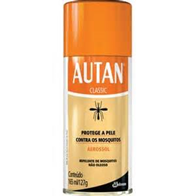 ~ Aedes aegypti mosquitoes are most active in the morning, and they prefer to bite our lower extremities (exposed calves & feet), so we need to either stay in mosquito*free areas (well-screened) or cover our legs & feet, or spray those areas with a good insect repellent. ~ Spraying indoor spaces with insecticide 3 times can effectively reduce both Ae. aegypti populations and reduce dengue & chikungunya infections. When spraying, focus on stored cloths in the closet (as the mosquitoes love our lingering body odors on our clothing) – physically moving the clothes to get the spray into the hanging shirts, dresses, etc. Also focus on spraying under furniture, like under beds, desks, etc, as Ae. aegypti mosquitoes love to hide and rest down low. Some aedes mosquitoes also like to rest on the ceilings. ~ Electric plug-in insecticide emitters (placas) and mosquito repellent coils are also helpful in reducing mosquitoes in our homes. The adult ae. mosquito lives roughly 1 month “in the wild”. Under lab conditions, they live up to 6 months. Once an ae. adult gets DENV or CHIKV virus, they transmit it for their lifetime: 10 days – 6 months. Mosquito traps (that emit CO2 from propane) or the UV light+fan ones work well at trapping just mosquitoes, but the ones that use a UV light attractant and electrical grids indiscriminately kill lots of many types of bugs. (reducing bat populations). Add “stink-bait” to make them effective. 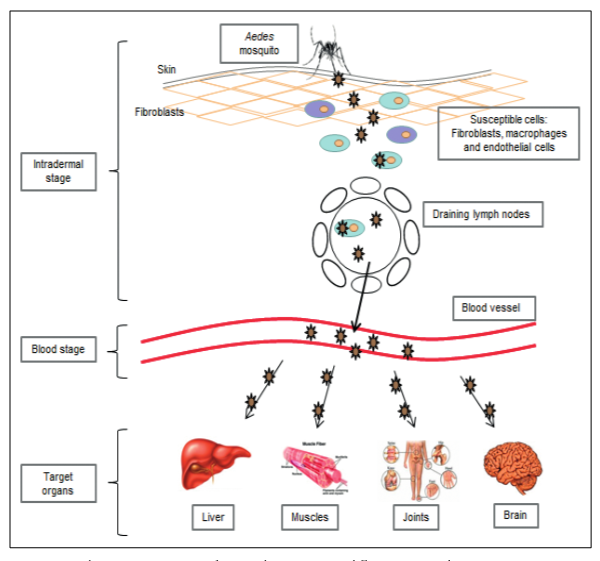 Dengue and Chikungunya Transmission occurs as a chain of events. Break just one link of the chain and Dengue/Chikungunya transmission ends. Uninfected female ae. finds febrile Dengue/CHIKV infected Human. Female ae. bites the febrile Dengue/CHIKV infected Human. Female ae mosquito hides, rests, digests for 3-4 days. Dengue/Chikungunya virus moves from the mosquito’s mid-gut up into the ae. mosquito’s salivary glands. Female ae. mosquito lays eggs in water. The now Dengue/CHIKV-infected female ae. mosquito finds another human and bites human. Male mosquitoes feed on nectar and plants. If you break or interrupt any single link in this chain of mosquito activity, (1-9), Dengue transmission stops, which makes mosquito control our best proven way to control the spread of Dengue virus. drain unused swimming pools to total dryness, and consider using a larvacide like Copper Sulfate to treat any rain water that accumulates during the owner’s absence. • Use Bt tablets (Bacillus thuringiensis). ~ Cleaning up exterior mosquito breeding sites helps, but clean-ups alone are not enough. Today’s “throw-away” society creates too many cryptic breeding sites around our homes. It only takes a tablespoon of clean standing rainwater for a week for successful Ae. aegypti mosquito breeding. This means bits of plastic, polystyrene, ceramic pottery, tires and other trash hold water, creating: cryptic (hidden) breeding sites across our cities. While humans are Ae. aegypti favorite blood supplies, they will less-preferentially feed on monkeys, rodents and birds. These other species do not serve as Dengue-reservoir hosts (NOT DENV transmitters), unfortunately monkeys, rodents, small mammals & birds can be reservoir hosts for Chikunkungunya (CHIKV) . Without a doubt, our past insect control measures alone have not been effective, especially in large urban environments due to all of our urban trash that holds the rain-water preferred by Aedes aegypti. This means our personal efforts are critical to eradicate adult mosquitoes & their breeding in our homes, our schools, in businesses and in our workplaces. That pretty much covers the things I remember off the top-of-my-head – but as always, we welcome comments and updates to keep the information offered here *fresh* and useful. ~ Please do NOT copy or use the images or tables or diagram materials without giving proper attribution to: * Dra. Maria Alba Loroño Pino and Dr. José Arturo Farfan Ale, UADY Centro de Investigaciónes Regionales * ~ as all of these materials are copyright protected, not for general public use.